After our Guide to Ribbon and our Guide to Bows, you should be a holiday decorating master. But if you feel like you’re still missing something that makes you stand out among your neighbors or surrounding businesses, there’s still plenty of time for us to help! In our final Decorating for the Holidays Guide, we are going to go thru some of our most unique holiday items. "If your house has no chimney for Santa to come in, or the chimney’s too small (Santa’s not thin). 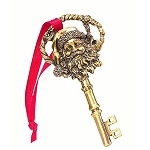 There’s nothing to worry about because Santa can see, how to get inside if you leave him this magical key!" 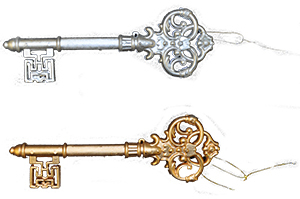 Whether it’s to give to your kids so they know Santa can get through the door, or as a gift at your big event, these keys will make Christmas truly magical. These economic gold and silver ornaments are the key to your holiday decorating success. Our key ornament/props can be hung as an ornament on the tree or bring more holiday cheer to your Key to the City or holiday event. Add an extra touch of Christmas Glow with our Glitter Key Ornament/Prop. Are you looking for a way to make your Christmas Unveiling even bigger? 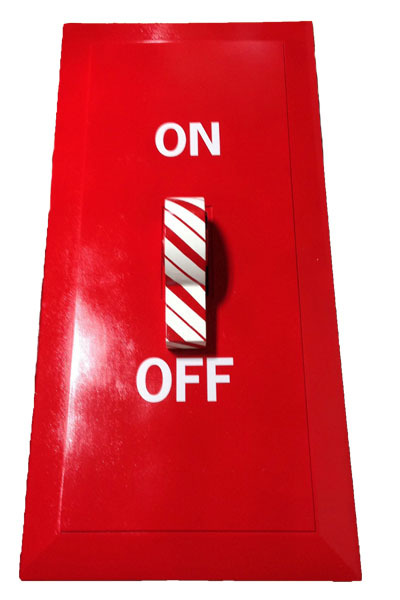 Look no further than our Giant Light Switch! Show off your giant Christmas Tree or elegant lighting display by flicking the power on. Our switches come in sizes between 3 feet and 6 feet. Customize with your own color or logo. 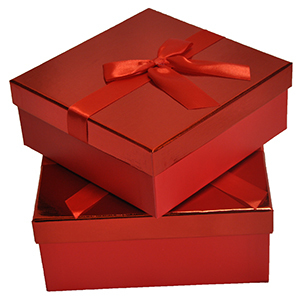 Make the presents around your tree stand out with these shiny square gift boxes. These boxes come as a nested set of two or can be purchased separately (price listed below is for both boxes). Each Box includes a lid with a ribbon on top and includes a bag of white shredded crinkle cut tissue. Whether it’s your showroom floor, office party, or having friends and family over, the easiest way to decorate is balloons. 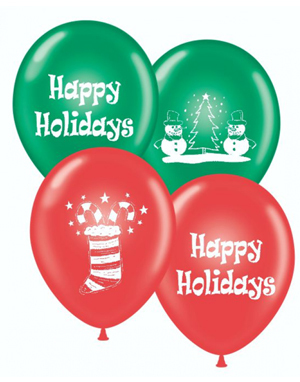 Our Merry Christmas/Happy Holidays Balloons will make sure your guests are surrounded by season's greetings and holiday spirit. 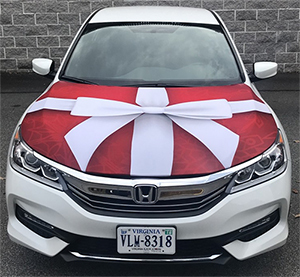 Our Festive Holiday Hood Covers are perfect for decorating the ultimate Christmas gift or the cars at your dealership. Starting or Ending a party with a bang, especially a holiday party, is always important to keep the event in people’s minds. One of the best ways to do this is with a confetti launcher. We have launchers of all sizes, but our continuous flow confetti launcher puts the exclamation mark on a party like nothing else. 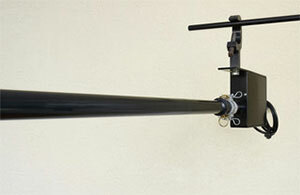 The Continuous Flow Confetti launcher shoots 1/2 lb of confetti up to 40’ into the air. 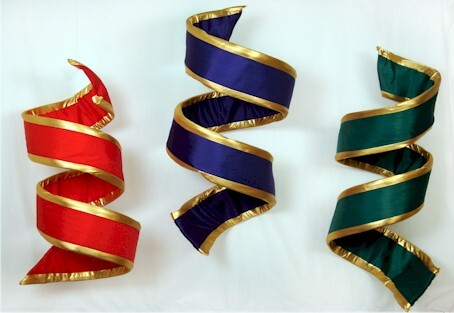 Add an elegant touch to your decorating this season with our Giant Holiday Ribbon Twists. Made from our high-quality velvet ribbon, these twists come in 4 foot and 6 foot sizes and will add a special touch of season’s greetings to your home or business. Ideal for hanging from your ceilings or overhangs. If you don’t like the twists but love the look of the fabric, this can be shaped exactly how you want them. 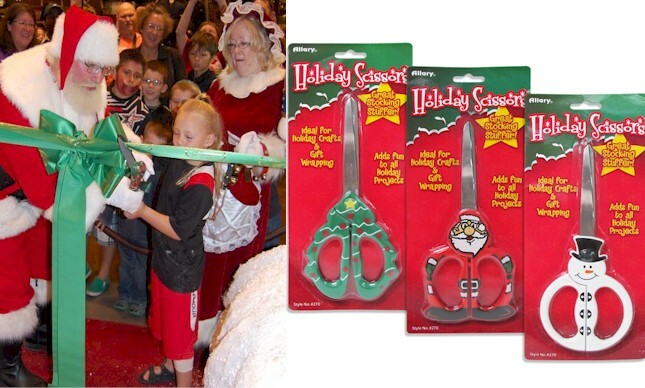 If you’re holding a Winter grand opening, ribbon cutting, or running a Santa’s Workshop, then these scissors are a must. These also work wonderfully for winter arts and crafts in the classroom. Our Holiday Scissors are not only cheerful but actually cut. Measuring 8", the blades are made with lightweight stainless steel. Available in Snowman, Santa, or Christmas Tree shapes. Brighten up your event at an affordable cost. Snacks are always a must at your holiday party, and our treats will make anyone with a sweet tooth get into the holiday spirit. For decorating, our Holiday Treat Filled Stacked Presents or Hanukkah Treat Filled Presents will give an elegant feel to your snack table and will fill your guests up with Winter bliss. 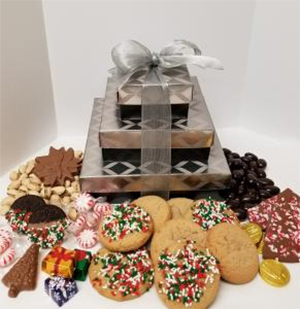 The Custom Season’s Greeting Cookie Tin can be used as both a decoration or a great take-home gift for employees or neighbors. Last, but not least, our Season’s Greetings Chocolate Bars make the perfect handout at the end of your party to keep your event in people’s minds. You are now a "Holiday Decorating Master". Grab your ribbon, bows, lights, and any other decoration you need and show your family, friends, coworkers, neighbors, and surrounding businesses how the season should be celebrated.